J. Paul Moore is a passionate man about nature, plants and photography. Dave and I had the very good fortune to talk to him, in particular, about landscaping around the porch. And Paul shares some fun stories of when he has photographed gardens - some which will have you laughing - or feeling bad for Paul. If you like our Porch Podcast, we'd really appreciate if you would tell a friend or two. We would appreciate if you would review us on iTunes. Thank you! 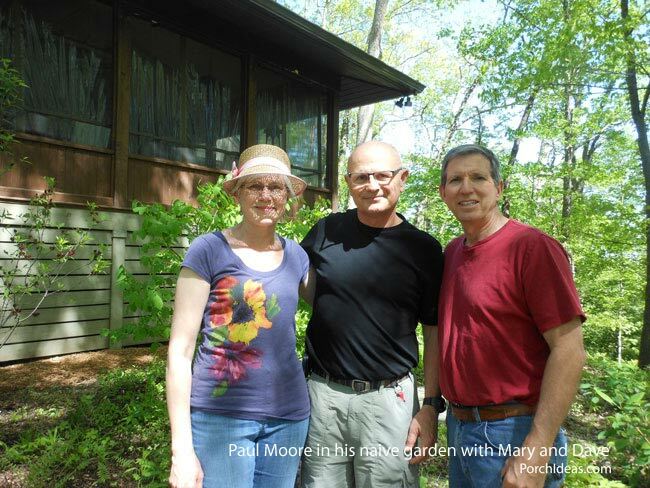 Mary: Landscaping around the porch with our guest, Landscape Photographer, Paul Moore. This is one of the things that makes him so cool. He is a very passionate person about nature and photography and he brings those two talents together in his work. Paul, I just want to welcome you to our show and really appreciate you being here today with Dave and I.
Paul: Thanks. I have been looking forward to it. Dave: Yes, it is really going to be very good. Mary: Very good! So I guess to start out with maybe you can just explain this a little bit about what is that you do and what you do with your photos. Paul: Well, I was in the nursery business for 32 years. I had a garden center business and during that period of time,probably almost 30 years ago, I really got interested in native plants. We lived on a shaded hill top and so I started experimenting with Tennessee native plants and growing those in the garden and having great success with those and just kind of started photographing and documenting my own garden, the progress of that and just kind of went from there. Mary: Very good and so over 30 years you have quite a library of knowledge in your head. Paul: Well I guess you would say knowledge. (Laughs) I love being around plants. I am constantly fascinated with new things. I have more of a collection garden of just about anything that you can think of that would grow in Tennessee within reason and some of plants are endangered species and are rare plants. Just so I can learn the plants, learn how to grow them, learn how to identify them in the wild. I love going into the woods and just seeing what I can identify and again since I just use my garden as a source for my stock photography business. One of the sources I am always photographing and just really trying to learn in intimate detail about plants. Mary: So you truly live and breathe nature and plants and photography. Paul: That I do, 24/7. Dave: Your photography though is amazing. So you've photographed all kinds of things. Can you tell us some of the projects you worked on before? Paul: Sure, I started in photography gosh, probably in the early 80s, but got really passionate about it. I started out really more in fine art photography. Just scenic photography unrelated to gardening and then I started documenting my own garden and sent photos of my garden to Fine Gardening Magazine and they liked what they saw. They flew an editor down from Connecticut and they interviewed me and then I ended up writing a feature story of my own garden with my photographs and they said, "Hey would you photograph for us on a regular basis?" And I am like, "Absolutely!" Mary: How cool is that! Paul: I started photographing for them. 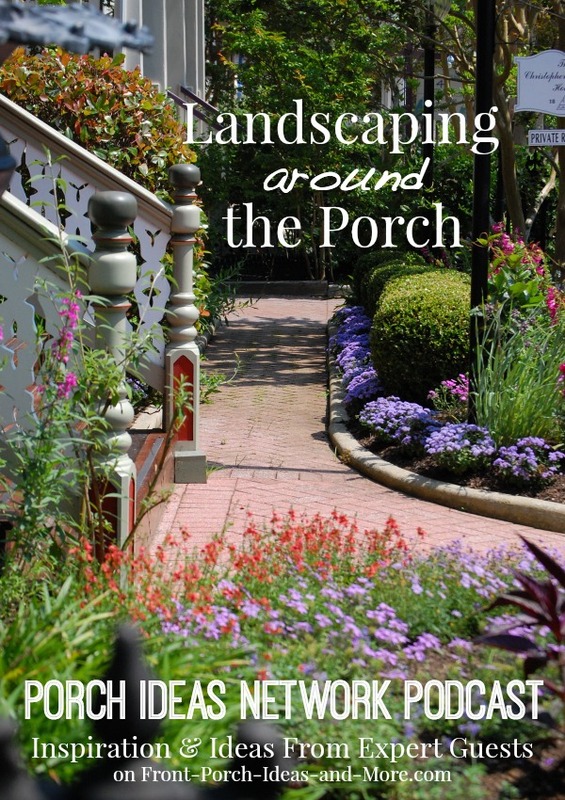 Then I started photographing and doing some work for Southern Accents Magazine and Garden Design Magazine. And then people were calling me just for general stock photographs for magazines and books and calendars and so forth. Mary: So is photographing gardens one thing that you specialize in? 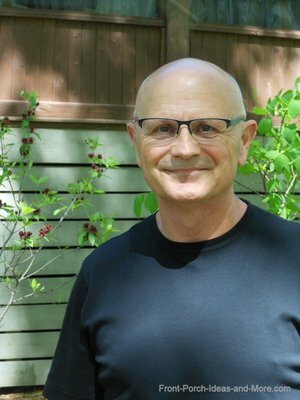 Paul: Photographing gardens is probably kind of where I get really started and then I got little more interested into the architectural part of it because I was starting to photograph for Landscape Architects. For me, that is my favorite topic because it is great plants with inspired architecture. Paul: And so I am photographing those and really like the man-made structures and how they relate to gardens and so forth. And just even pure architectural photography is interesting to me. Dave: Well that just leads us right into our best architecture that we know of and that is a porch. Mary: That's right up our alley. And we like the idea of beautiful garden. Landscaping around the porch. 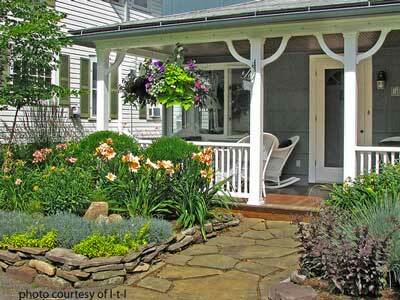 Dave: Nothing makes a porch look nicer than beautiful landscaping. Dave: You can look at the porch and you can enjoy your yard more. It is just enjoyable to be out there surrounded by aromatic or just beautiful plants and shrubs and things. And so that's kind of where we get into it. 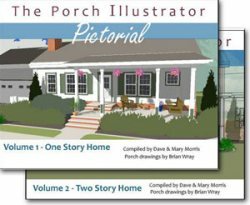 As a homeowner, you know just a typical homeowner, what kinds of things should we take note of when we talk about planting in front of our porches? Paul: Well, having the original prototype porch on our home from The Porch Company and being able to live with it, we have some unique aspects of our porch which has been fun to landscape. One very important consideration is that we have very deep eaves on our porch and if you plant plants underneath those eaves, I guarantee you would lose them. So it is important to pull those if you do have deep eaves. Pull those plantings out far enough where they will receive natural rainfall. Mary: Ok, is that because they get too much moisture? Paul: They don't get enough moisture. Mary: Oh, they don't get enough. Paul: They don't get enough. Mary: Oh, I see. They are protected. Paul: And also with that, it creates a unique opportunity if you pull those plants further out, then it makes your porch easier to maintain. Dave: Because you can get between the plant and the porch itself. Mary: Oh, those are really good points. Paul: And I actually have a path behind our plantings at home where I can actually walk behind those, and it just gives me access to another part of the garden. Dave: That is a really good tip. Mary: Those are some very good tips that I would not have thought about. Paul: The other unique part of our porch is with these deep eaves we do not have down spouts. The down spouts, you know, unless they are copper and some wonderful thing (to me), visually detract from the porch so we use water chains. I guess the Japanese maybe started water chains first or some Asian influence and then Frank Lloyd Wright made it popular at his homes. And this chain is suspended from the corner. Water just goes down the chain. And the chain for us at our home, it goes into a decorative container filled with porous lava rock, and planted at the base of that are plants that like the extra moisture. So it is kind of a rain garden. Mary: And it is beautiful. Paul: It is beautiful and fun and it actually creates a sound as the water goes down the water chain. It is just so much fun to watch. Dave: That is, that is. Dave: We have to come out and get a picture of that. That's really good. 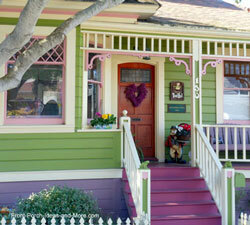 Another thing that helps with is when you see porches with railings and shrubs. Sometimes the shrubs even get taller than your railings which really does not look the best. But this way you keep that space between there. Paul: You keep that space, right. You keep the space and also you know there are so many opportunities to plant things around that space. You just want to pick the right plants. 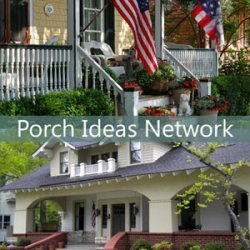 And a lot of times people think about their porches especially like a back porch. They don't really consider things like what the porch really looks like from the inside. Instead of the curb appeal you are looking for in a front porch, the back porch is about views. What are these views out of each section of the porch? What are they framing? You might want to do something practical like hide your neighbors garage or basketball goal or something like that. Or you might want to just bring in some fragrance into the porch. To me it is like bring all those wonderful things that you want to experience in nature. Bring them up closer to the porch where you can see your humming bird feeder or a beautiful tree that is flowering a certain time of the year looking out at the porch. Just taking advantage of it. It doesn't have to be planted directly in front of the porch to gain the benefits of a fragrance but the prevailing winds. Have things that bloom at different times of the year so there is always some wonderful fragrance wafting in. Mary: It is a great perspective on the back porch. It is kind of like the curb appeal is from the other side than it is from the street. 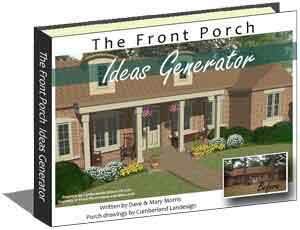 Paul: Another consideration for your porch is - does it have a walkway? Like ours has a walkway in front of it. Well, if you have a choice when you are designing the walkway, you want it far enough out away so that you can maybe layer your plantings. You do not just have a row of shrubs in front of it. Dave: It can be pretty typical that most people do (just plant a single row of shrubs). Paul: And if you have a nice curved walkway, or a deeper walkway, then there is no law that says you can't cross the sidewalk. Or cross the walkway. And just kind of take in some of those geometric lines and softening them. 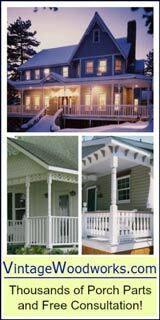 Dave: I can see where that is a great idea especially for small porches because you can use your landscaping to kind of give the impression that your porch is actually larger than it is by doing some of those kinds of things. Mary: So, Paul, when you photograph gardens and things around the porch, have you ever come across any surprises? Paul: Oh, I have had lots of surprises. Happened on the garden shoots. One of which I did a photo shoot for Fine Gardening years ago. It was a church near Montgomery, Alabama. It was before cell phones got popular or very effective and I showed up at this site. I had actually scouted it the day before. I got there that morning at sunrise. And I was there all by myself in this beautiful church garden and I started photographing and the irrigation system comes on. Well, I thought I could outsmart it so I would literally pack up my gear and run to another spot and start photographing there but it was like this thing was following me. [laughing] So I did the entire shoot while the light was still good with the irrigation coming on. Mary: Oh, that is funny. Paul: One time I went to photograph a porch one morning. When I got there the customer had forgotten that I was coming and they had a very bad dog get after me. And if it wasn't for my tripod. I might not have made it out. Dave: (laughs) That might have become a viral video. I can just picture that. Paul: That was just kind of the quirky things that can happen but when I am looking at something to photograph. It is really all about the light. You know, the quality of the light, what I call sweet light like early morning or late afternoon light. That angular warm light is really nice to photograph and it really shows the project to the best. Mary: Would you say when the sun is not shining directly on the garden? Paul: When the sun is really bright and there is no cloud in the sky, we call that severe clear in photography terms. And that's when I usually put my camera up. And the human eye can see much broader ranges of light, so we can compensate for that with our brain but a camera just can't capture all the shadows and all the highlights. It just doesn't work photographically. But I am always looking at the condition of the plants. Being a plant person you know if there something detracting here. You know if there is a plant that is wilted or dried. Or are there some spent flowers that need to be removed? Is there a birdbath on the corner that is skewed and needs to be straightened? Or is there a garden hose out of the way? Or if the lines of the bed are crooked, you don't want that. You don't want to see a lot of mulch generally. You want to have those filled in with plants so I can instantly look at a garden around the porch or any structure and say well it is ready to shoot or it is not. Mary: It is kind of like when you are getting your house to sell and you stage your porch or your home. Is it kind of the same way? Paul: Exactly. I look at things like what does not belong here. And if you can take the time to remove those things that are what I call an eye sore and really transform the shoot. Sometimes it can just be wetting down the surfaces. Dave: This brings up a good point. You mentioned about what plants do or do not belong there. In terms of a planting bed in front of a porch certain things go with certain things. Can you give us some suggestions about what works well together, as a planting group? 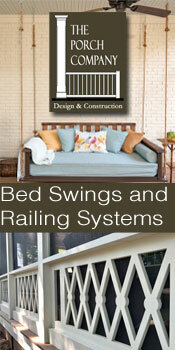 Especially if you have different heights, you have got a porch that sits up higher and how can you create that? Paul: Well one of the things you can consider is whether you want evergreens or not. A plant that stays green year round. If you are going to have evergreens in addition to some of the other plants you would have them closer to the porch to create the foil or the backdrop for anything you want planting in front. Now in front of those evergreens then you have a choice of some flowering shrubs and things with fragrance. Perennials or annuals or any number of things, but to me one of the more important thing in all the years I've been in the plant business - no matter what you are choosing - is that the textures are really more important than the bloom. Perennials, for instance, to me the foliage has be as pretty as the bloom and the reason being is when it is not in bloom if the foliage looks like a weed then to me I don't like to look at that. So just vary the textures up. Even an all green garden can be beautiful if you have different shades from chartreuse to yellow green to green to black green. So you can create visual interest. Some of the most beautiful gardens that I have seen have no flowers at all. They have this amazing range of colors and foliage and textures and all those play together. There is an over emphasis with thinking perennials. They can be a lot of work and orchestrating all the bloom times, and the heights and when to cut back. You really need an expert to help you figure that out, so you can get quite involved and I much prefer using more the flowering shrubs and evergreens as the majority of what I would end up using with ground covers. Dave: Yes, that is a good advice. Especially for people who don't either have the skills, the knowledge or the time to go out and time to maintain. 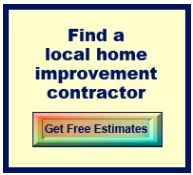 Paul: They can lower your maintenance tremendously. Mary: And then you believe in adding some annuals in there as well. Paul: Well, I love to do annuals because you know what you are going to get. Mary: I haven't had much luck like simple plants like petunias. I used to be able to grow petunias really well and in the last few years not so much. Paul: Sometimes I think the hybridizers breed the vigor out of plants. They are making all these improvements for flower color and all these different things but they breed the fragrance out, the disease resistance out, just the general toughness of the plant out. But again you want to make sure you have really good soil where you are planting. You know that it is the right plant for the right soil. Right exposure and so forth but if you create a pocket where you plant annuals every year, with evergreens behind or whatever, then you are going to have show from early spring till frost usually. Dave: Yes, you mentioned soil conditions there. Any tips for the average homeowner that has a plant bed in front of their porch or yard? About the soil. A lot of people just buy plants, come home and stick them in the ground. Paul: Well soil is so critical. It is like the foundation of the house. You get the soil right and then your work is much easier. It is easier to plant. Y ou know you can start out with areas not prepared by tilling in the soil and get the soil improved that way. Mary: Unless you live where we do. We have rocks! Dave: We have rocks and clay. Paul: That opens up a different thing. There are some great products to break up clay. There is a product called Complete Landscape Mix. It is one really good product. It has permatill in it, is like shelly, rocky type product with some humus so you got more organic matter and drainage material all in one. Dave: Should you try take out some of that clay first or leave some? Paul: I would try to. You want some binding properties that clay has so if you can get the right proportion and mix that together the clay is not bad. But if it is solid clay, you dig it out. I is just going to be like a ball and all the water is going to run out. You are going to have problems with plants rotting. You got to have drainage. Mary: In front of our porch we have some landscaping that the contractors put in. So our house is just like a year old, not quite a year old. And we would like to do a lot more with that sort of cottage-like garden. Where does a homeowner start, if they are starting from just a blank slate and they want to have good luck with their garden? They want it to grow but they also want to take advantage of native, plants and the conditions of their area. You know, whether it is sunny, or whether it is shady. Where do they start? Paul: Well, if you can do this, I highly recommend having a professional that really knows the plants and the soils come look at your particular situation. Because they can advise you make you getting in the right direction. They can look at the soil; they can look at the exposure. In your situation look at the surrounding woods and see what types of native plants are growing there and try to adapt some of those in your landscape, you know those will work. Mary: That is a really good tip. Paul: But I have so many times when people would ask me to come advise them about a particular landscape and they have cleared out around there house and they ended up, well we ended up recommending that they plant those same things back - some of the same things back that they cleared out. So it is like if you have any existing wild areas around your home to learn what those are and try to add more of those types of things to your landscape. But a professional helping you with the design and some of that to at least help you get started is highly recommended. Mary: It would cut though some of the learning curve. That is for sure. Dave: Yeah, it would definitely would. Paul: Well ultimately I think it saves you money because if you are buying the wrong plants, you are spending a lot of time and money adding and replacing. You are better off up front to take your time to invest in and have a professional look at it. Dave: A lot of porches are either going to get full sun, or full shade you know you always have those type of things. Or it is wet, or it is really dry. There are some ideas that people probably use for difficult planting areas. Paul: Well this is one area, where natives really shine when you get into areas especially when they are wet. There are certain native plants that really like what is referred to as wet feet. 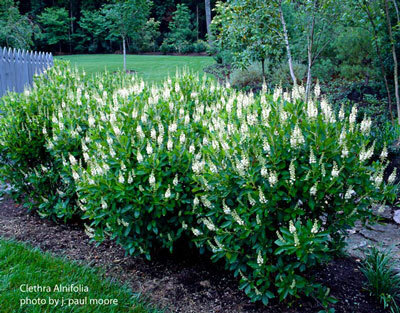 One of them is Virginia Sweet Spire, a wonderful native with white fragrant flowers, turn brilliant red in the fall. It will grow in standing water. Mary: Wow, and I love that it changes color in the fall. Paul: Beautiful color. There is another one called Summersweet which has these white, pink or light red red spiky flowers in the summer that will also grow in standing water, and they attract butterflies. Mary: Oh, we like that too. Dave: People love them for the birds and the butterflies. That's great. Paul: And again for bringing nature into the porch for bringing in so where you can enjoy them more. 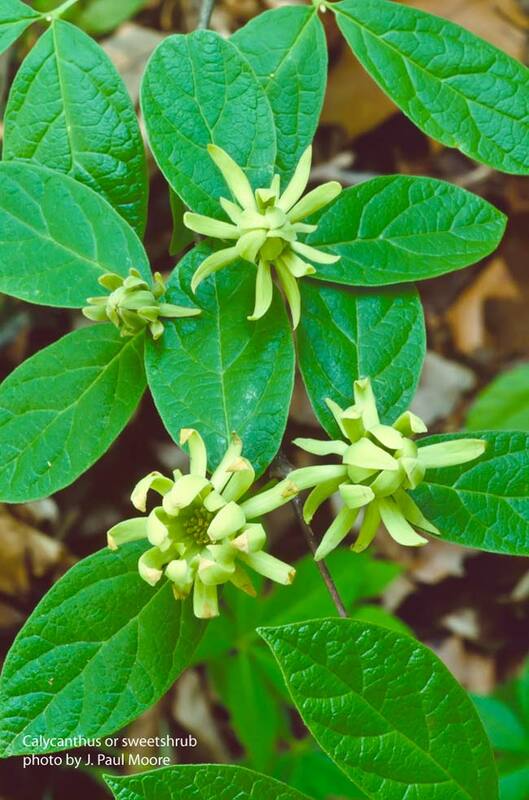 There is a plant call Calycanthus or sweetshrub and it has kind of ruddy red flower, typically although there is a variety of green flowers and the bloom smells like juicy fruit gum. Sweetshrub is the common name or Carolina Allspice. And my grandmother used to use the bloom is a sachet. It has been around a long time. Dave: That's pretty neat, pretty good. Paul: A really great plant for a dry shady, semi shade conditions is St. John's Wort. Paul: There are ground cover forms and there are shrub forms and the one I am referring to is the shrub form. It has a nice mounded habit. The top is yellow flowers. Paul: Flowers are great for attracting finches. The seeds. Mary: Oh, there you go. Dave: We like that, we like that a lot. Mary: How about plants that are invasive? I know for example, I like mints. And I like the smell of fresh mint. But I also know it is very invasive. So would you advise to just not have that. Or do you have any tricks that you can use to keep it at a minimum? Paul: Well, that is a great plant to use in a container where you can control it. Paul: Or if it is in the ground, you can keep it away from your more refined plants or try to border it with something really substantial but otherwise in containers. It does great anyway. Mary: When you go to someone's home to photograph their garden, what are some tips that you can give to homeowners for getting their space ready for a photographer to come? Paul: Well, again a lot of it is just making sure if there is a mulch bed in front of it that the edges are really nice and clean those beds. Remove any broken damaged branches. Ideally you don't want to see a lot of mulch so any thing you can do to plant and fill those areas where you are not looking so much at mulch is great. Just generally cleaning, make sure the porch is clean and free and looking for stuff like especially for detail shots. Cobwebs in the corner and grass stains up against the base where the mower has been. I have seen that on some beautiful projects before. So just really look at it to ensure that it is really clean and neat. Make sure again if there is any garden hose. Just put everything away that would detract from that photograph. And then determining if whether this really is a better early-morning shot late or afternoon shot and then you know if you if you have a tripod, set your camera upon the tripod. Your process for photography is much more methodical when you can look carefully in the viewfinder to get everything. You want everything nice and level and straight and so forth. And to get the whole porch sometimes you need a wider-angle lens, to be able to capture that. So make sure you have the right lens. Sometimes you want to do little close up details. Get more telephoto type lens for that. 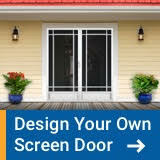 Mary: One of the things that we talk on our website sometimes is how do you create privacy on your porch. 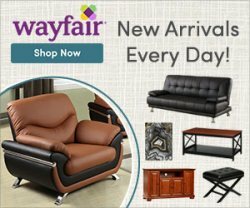 Whether it is because there is something you don't want to see or because you want to have a nice little conversation area or where you can go read a book. Do you have some ideas for vines or plants that will make a nice privacy fence? Dave: Yes, around the porch. Paul: Well one of my favorite general vines is call cross vines. Paul: And it is such a native the botanical name is big Nonia. And there is a particular cultivar called Tangerine Beauty. So it has got these strap-like evergreen leaves and these bright orange flowers. Paul: So it is a really pretty one for evergreen, semi-evergreen coverage, of course. That is the biggest considerations as it needs to be. 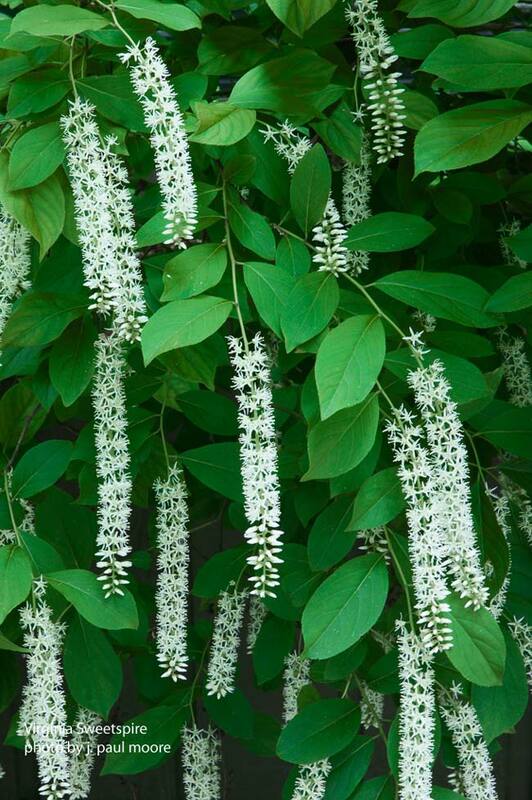 There are lots of deciduous, you know wonderful vines such as clematis. Planting roses, just whatever kind you want and amount of maintenance but just as a general vine, the cross vine is probably one of my favorites. A lot of times, too, for privacy you know you are thinking outside as well. Sometimes some of the upright evergreens or carnivores to block out neighbors or something is arbor vitae or upright Holly. Another one of my favorites, it requires a little bit more room is a dwarf Southern Magnolia and there is a particular form called Little Gem and Gem is like gemstone G-E-M and it might get 20 to 25 feet tall, but you got fragrant flowers all summer long on this variety. Paul: So you get this wonderful fragrance, the screening. It is one of my favorites to incorporate in the landscape when you get room. Mary: Just makes you want to be on the porch. Gosh we've talked about a lot of different things. Dave: Yes, we have, we really appreciate it so. Mary: Paul, is there anything you might want to add, that we haven't talked about in regards to planting about around their porch. Any ideas? Paul: Well you know, I think we have covered pretty much everything, again though one of the things you mentioned was herbs. 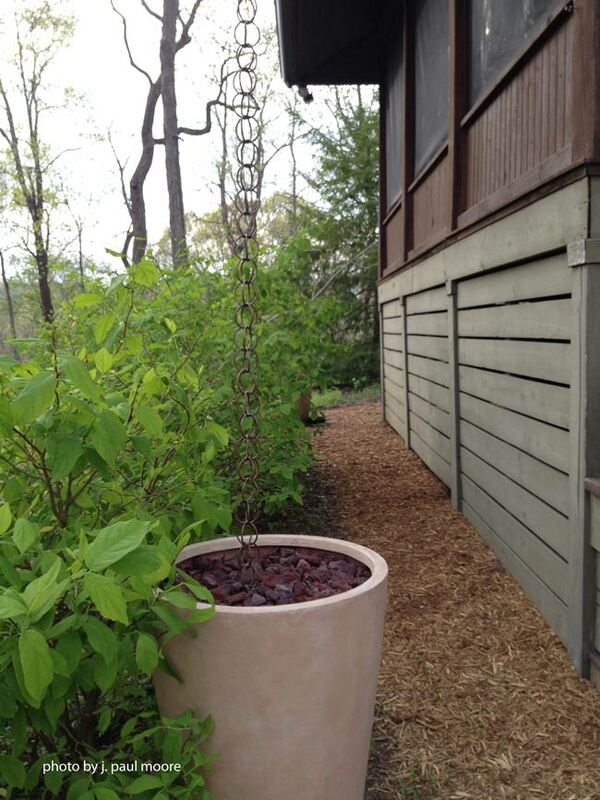 Paul: Container gardening, you know especially access to the house with herbs. And you know you can mix herbs with flowers. You can have herbs in the garden or herbs in the container. Yeah, you got flowers, you got fragrance, you got culinary use of them so don't be afraid to mix and match herbs in and around your landscape either in your containers or in the ground. Mary: I love being able to go outside and just pick some basil or oregano or chives and bring them in. Paul: Yes, it is nice not to have to go out into the garden to get those. Mary: Well we are very honored to have you here with us today and sharing what I can tell is just a wonderful passion of yours. And we would like to know how people can get in touch with you, if they would like to learn more about what you offer. Paul: Best way is through my website, www.jpaulmoorephoto.com. Paul: And you contact me through that through the e-mail through that and take a look and see what I do. Dave: Well, we appreciate it. Thank you, Paul. Paul's passion for plants and photography is evidenced by his exquisite work. Paul captures, through a lens, what most of us are too busy to see, the beauty of nature at its best. Take a walk with him through his native plant garden and you'll be captivated by not only his enthusiasm but knowledge as well. He can tell you the name of plants in Latin too! Sought after by magazines and landscape architects, Paul is most comfortable in nature finding just the right frame to highlight both natural and architectural features. We highly recommend contacting Paul to photograph your landscaping, whether it be your residential home or for commercial purposes. And when you do, ask him about his moss yard. 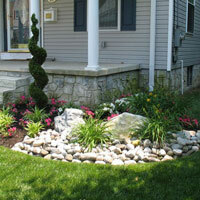 Paul visited our home and we are happy to share with you some of his creative landscaping ideas. You can contact Paul at J.Paul Moore Photography.